Air Photography has brought to light an impressive group of prehistoric and Roman sites in Islip. Remains of settlements were found during excavation work for the by-pass, but probably the most interesting find was during the development of the Lowick Road, when a burial ground was located and a female skeleton found with a clasp around her ankle and a shroud pin in the form of a bronze cross. The Anglo Saxon pin was dated at around 600′. It is said that Nene View was built on a Saxon burial ground. In December 1922 a curved tusk was found in a gravel pit on the Kettering turnpike. It was buried 14 feet deep and was identified as a pre-elephant species. The tusk was 5 feet 4 inches long and the animal was estimated to have weighed between twelve and twenty tons. It was concluded that the animal had lived during the mid-glacial period some fifty thousand years ago. Percy Stafford remembers going to look at it when he was a child. It was found just behind the Kettering Road Garage. A head beam in Islip Wharf has an ecclesiastical type stone which may have come from the old hermitage, but this has never been proved. The bridge was described as consisting of seven round arches and four cut wakes facing up stream, and two down stream. Bridges, the historian, says the ruins referred to by Leland were probably those of the Chapel of St. Thomas the Martyr in a close called Hermitage Close on the right hand side from Thrapston `In which stood several stews of water’. In 1492 Henry Vere bequeathed 10 shillings to the chapel. It was described as one of two chapels annexed to the mother church of Islip. The Islip Cross? John Nicol, in his will dated 1531 refers to a cross in Islip church, perhaps the remains of a wayside shrine, and gave 8 pence for the repair of “the Alledge cross”. An old account refers to Alledge Leys and Alledge Furlong in Islip. No information has come to light regarding the age of the Woolpack, but as it is situated near the river crossing, its origins are thought to be extremely old. It was formally owned by the Drayton Estate, and records show that in 1798, William Blunsum was the tenant. In 1882 William Beaver was paying £48-00 per annum rent, and the acreage was 9 acres, 2 roods, and 34 pole. In 1915 it was listed as a Public House, with a billiard room, lumber house & fuel house. Outbuildings consisted of stables, saddle room, gig house, chaff house, barn, pigsties and lavatory. Much of the outbuilding has now been pulled down. The Coroners Court was once held at the Woolpack, and the barn was used at one time for laying out dead bodies which had been retrieved from the river. As a result of the many suicides in 1916, a shelter and life buoy were erected on the nearby bridge. Set back behind a stone face wall stands Islip House. This is a 16c house which was re-modelled in the 18c and once was the home of Thomas Squire, whose father John* was famous for playing a large part in making the River Nene navigable from Peterborough to Thrapston. The grand opening of this engineering feat was in November 1737. Wharves were built on both sides of the river, and the stone warehouse still stands. Beneath Islip House were bonded wine vaults. A mystery surrounds a tunnel which runs East to forward by historians, one of which is that it may have been a stone cellar from an earlier building as older foundations were discovered in the grounds at the same time (1972) – or it may have been part of a drainage system. Islip originally had two forges. This one bears a date stone of 1763 and was constructed in limestone with a pantile roof. The forge and house are part of the Drayton Estate, and the initials W.B. S. ( William Bruce Stopford of Drayton House) are inscribed on a set of built in drawers. The last blacksmith (Chic Steward) died in 1976, and it is no longer used as a forge. It isn’t known where the other forge was situated. The first schooling in Islip was late 17th or early 18th century. This was undertaken by the church auspices and was held at the home of Mrs Spencer, in one of the Medbury Cottages. Under Mrs Spencer’s guidance about 20 children were taught to read and sit still. Mrs Spencer met with a tragic end – she was burnt to death. At the same time that Mrs Spencer was teaching the alphabet, another school called “The Charity School” was held at Pear Tree Cottage, where ten young girls of the village, who had brown dresses and white caps given to them, were taught. The Dame who acted as mistress was a Mrs Freeman, who it was said could not write herself She was followed by a Mrs Cracknell and then Mrs Stanton who taught knitting, spinning and reading. This “Charity School” had some share in the school at Lowick, established by Sir John Germain and Lady Elizabeth, his wife – he died in 1718. In 1861 Mr & Mrs Stopford granted and conveyed to the Rector and Churchwardens a piece of land – 40 perches – for the building of a school for the education of children of the parish. The first master was Mr John Udall. He was appointed in 1862 at a salary of £50 p.a.. with accommodation, or £55 if he found his own. The School Secretary was requested to solicit subscriptions from various residents and to order maps of the World, England and Palestine. Later that year a mistress for needlework was appointed for £10p.a. Two years later Mr Udall resigned; that same year children of tradesmen were asked to pay 3d per week. Mr Collins was Master from 1865 – 1868 and in 1869 Mr Beale was appointed stating he was a Probationer entitling a school under his control a Government Grant. He was found to be a fraud and was discharged. Miss Wrigley followed in 1870 and in 1877 Mr F.Slatter took over and he was the first to occupy the School House which was built that same year. In 1883 the first enlargement of the school was carried out under the Rectorship of the Rev. W. Wynter; in 1894 the school was further enlarged. Islip Managers decided to provide further accommodation and felt that £250 would be needed. The following year, 1905, plans for the “enlargement” of Islip School were approved and the Managers now planned to spend over £430 on the new school and to renovate the existing school by £70-£80. In fact the total cost was £730. On November 9th 1905 the new school building was dedicated by the Bishop of Leicester. The day started with celebration of Holy Communion. The Bishop of Leicester arrived at 3 p.m.. to a peal of bells and after a short service in church processed from church to school to the singing of “Onward Christian Soldiers”. The Service for Invoking the Blessing of God on the new Building was followed by tea for 150 parishioners and friends in the old school room. After an Address by the Bishop there followed Festal Evensong. At this ceremony a sealed bottle was placed in the wall containing the children’s names, two covers of the parish magazine and four new coins of the realm. In 1906 water was supplied to the school and the school house. For 30 years a well on the school premises had not been used but the spring was again unearthed, a pump provided and the school endowed with water which “even for flushing purposes alone will be invaluable.” Cost – £30. In 1909 a Violin Class was started and 12 pupils met on a Saturday afternoon at 5 p.m. in the school for instruction. In 1914 the Managers felt that the school needed painting, but because of the war this work was not carried out until 1921 with the enlargement of the west window. This work cost £85 – twice the cost had the work been done in 1914. During the war years the school children did their bit to help – they gave up their “school treat” donating the money to help soldiers in hospital, and it is not until 1920 that items about the school are given prominence again. By 1920 the school library contained a hundred volumes, and the school football team was flourishing. The club was self supporting – in colours of blue and white. Records show that they lost 3 games and won 2 that year. During the next six months Islip effected the formation of a Junior League thus putting the training of the boys of the whole district on to a sound basis. The Rector gave a silver cup – “an object for which to strive”. Home matches were played on the Rectory Field and boys were eligible up to 15 years of age. Lowick, Thrapston (S.James), Aldwincle, Keyston, Woodford, Denford, Ringstead, Twywell and Islip (S.Nicholas) joined the League. At the same time H.M.I. sanctioned the inclusion of sport and games in the school timetable. The boys were allowed the use of Mr. Agutters’s field (now Rectory Farm). For this they paid a nominal rent of £1. The May Day proceeds in 1921 were spent on two cricket sets, the use of which girls and boys and infants participated – and throughout the season the school won every match. By now the school had 98 pupils. The boys wore a school cap, registered design, which they promised “never to disgrace by appearance or action”. The school was so successful that the H.M.I. was advising headteachers of neighbouring schools “to send older children to Islip”. In 1923, the water supply was laid to the school at a cost of £85. The sewage system was found to be very faulty and a grant was made from the Lowick Endowment Trust. In 1929 Shrove Tuesday was still a school holiday together with May Day, Ascension Day, Whitsuntide and two days for the feast. However after a Dance held by the Girls Club there was a litter problem – beer bottles, matches and cigarette ends had been left lying about. Electric light was installed in the school and the school house in 1930. In 1938 plans were made to build a Central School in Thrapston for those over 11 years old, and in 1939 a headmistress rather than a headmaster was appointed to the school. 1940 saw the arrival of refugee children in Islip. There were 96 visiting children, which together with 86 local children made a total of 182 children in the school which only had accommodation for 152. Two London boys were caught smoking in the lavatories and the “Riot Act” was read. In September 1941 the Firewatch were allowed to use one room of the school for their duties. 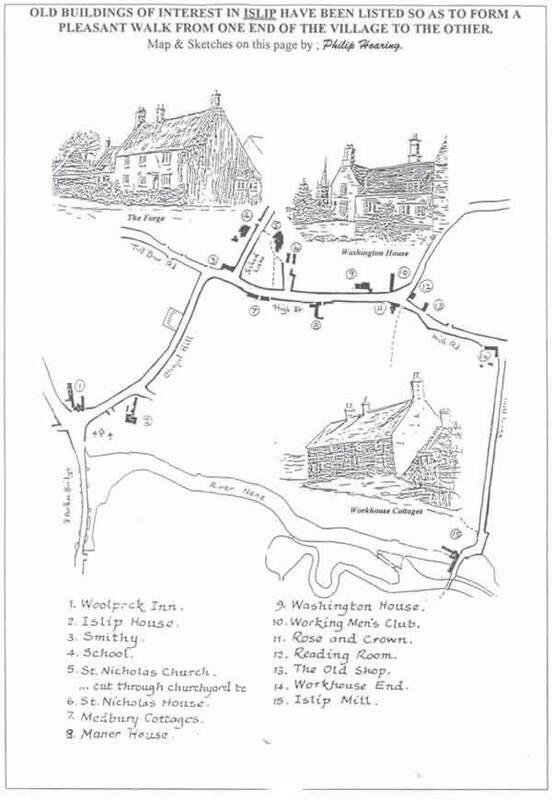 In 1946 it was recommended that Islip remain a Primary School together with Lowick and Sudborough, and two years later a first aid class was started for the older girls, and plans were made to start a Youth Group in the village. The school applied for Controlled status in 1951 and the following year the School Meals Service was started. Hot water was supplied to the school in 1961, and in 1962 with the closure of Sudborough School it was agreed that the Islip accommodation would be 194. There were 43 on the roll at Islip. The Parent Teachers Association was formed in 1970 and in 1975 the whole system was thrown into disarray with the abolition of the 11 plus and the introduction of the three tier system in the Islip area. Islip children transferred to Thrapston Middle School at the age of 9, and then to Oundle to the Upper School at 13. In 1982 the school roll was 63. Because of falling numbers the school closed in 1992, Children now attend Aldwincle Trinity School. The church was built in the 15° in Perpendicular style. Building began about 1400 AD with the tower and the spire, followed by the nave about 1430-1440′. The builders were local masons who worked under a master mason, and these men are believed to have lived in the stone and thatch St. Nicholas house, next to the church. There can be little doubt that a much earlier church existed here before the present one. The font and proscenia to the south of the altar in the corner of the west wall dates from the middle of the 13°. Also the Consecration Cross near the north door belongs to the same century. There are also traces of the 13° church in the base of the tower. The stone benches along the walls of the present church indicate that it was probably unseated, and stayed this way until after the Reformation. Unfortunately, during restorations in 1854, much of the stained glass from the windows was lost, some was medieval. A parish magazine of 1906 records a description of these windows and there were 14 coats of arms in the windows mainly belonging to the Lords of the Manor at Drayton. Other windows depicted Apostles and the Virgin Mary. In the south wall of the church there is a monument to Dame Mary Washington, whose husband, John Washington of Thrapston, was uncle of the John Lawrence Washington who sailed to America in 1657 and so became great-grandfather to the President. Mary Washington died in 1624. On the north wall of the chancel is a monument to her mother, Katherine Curtis, who died in 1626. The other American connection is that of the Nicoll family. The original brass commemorative plate of 1467 disappeared, but was replaced at the beginning of the 20° and has the original inscription. This brass was presented to the church by generous Americans. They also presented the oak chancel screen in remembrance of the Nicoll family which included Mathias Nicoll who became mayor of New York in 1671. It was said of him that few English men of his time had a keener perception of the practical necessities, or a character more admirably fitted for the position. He became speaker of the N.Y. Assembly 1683-4 and Judge of the Court of the Admiralty in 1686. In 1683 he became the owner of land on the south side of Long Island, an area of about 10 square miles which he named Islip after the English birth place of his ancestors. This thatched cottage is the oldest one in Islip, and served as a home and workshop for the masons who worked on the church. Although the building has medieval origins, it was much altered in the 16′ and early 17′. It was formally divided into three tenements where three separate families lived. A recess inside the cottage on the back wall still exists where Miss Souster tells us the `pug’ was made ( Pug is a mixture of water and clay). St Nicholas House is now used by the Guild of St Nicholas, run by Miss Barbara Souster. The Rev. Henry Medbury was Rector of Islip from 1681 – 1705. When he died he left money for the building of two stone houses for “two Poor Widows which the Trustees shall think most fit, and which shall have been honest and sober in life and conversation, and frequenters of the service of the church in their parish shall have never before received any collection.” Unfortunately, the inscription on the front wall has now been worn away. This is the house of the main Islip Manor, held since the 12C by the family at Drayton. The House is “T” shaped with 17c stone mullion windows. The porch on the front of the house originally came from the now demolished Toll House on the Kettering Road. This was once the main manor house of the Norwich family, and also the home of Dame Mary Washington, who died in 1624 and whose memorial is in the church. The house is thought to be 16c with later additions. On the left next to a 17c stone mullion on the first floor window are the remains of a squint. Within living memory this house was divided into three tenements, one of which was a shop selling confectionery. This building was formally Alf Knight’s horse collar factory, and in 1932 the first meeting of Islip Working Men’s Club took place. It was registered as W.M.C. on 8th Dec 1932. In Sept’ 1938 an urgent meeting was called to discuss Air Raid Precautioning, and the A.R.P. First Aid Post was in the W.M.C. The Rose and Crown has a date stone of 1691 above the door although there is evidence to suggest it hasn’t always been a public house. The interior has spine beams and remains of an open fire place. In the pub yard was a butchers shop, and this stone building still exists. In 1849 Whellans Directory names the landlord of the Rose & Crown as Zach Mosely. In 1897 the Chairman of the Parish Council stated that Mrs Sackville had offered a piece of land known as “The Pound” to the Parish Council on a lease of 99 years This was for the purpose of building a Parish reading room in commemoration of the Queen’s long reign, and to be erected by voluntary subscription. In fact a reading room with small library and billiard room was built. The reading room ceased to operate after the W.M.C. became established. It is interesting to hear that only men were allowed to use the reading room, and according to Mr Percy Stafford it cost about three half pence a half hour to use the billiard table. The premises now house the post office, but prior to this the post office was in the stone house between Washington House and the W.M.C. Outside the Reading Room was a pump, and this was known as pump corner. The Old Shop on the west side of Mill Road is dated latter half of the 18′ and built in brick and stone but rendered over and thought to be partly timber framed. Within living memory, this was Mr Crawley’s shop, but is now a private residence. On the east side of Mill Road are a row of cottages which were almost certainly the village workhouse. The terrace consists of five cottages with pantile roofs which form an “L” shape, and are dated as late 18`. At the moment of writing they are derelict, but have a preservation order on them, and due to be restored. These cottages had very small twisted staircases to the upper floor. A story is told of a large woman who died there, and to get the coffin out, a window had to be taken out, and the coffin lowered into the garden. The present mill dates back to the mid 18`, but doubtless a mill stood here long before. Thomas Squire leased the mill while working on the navigation project in the early 1700′. Flour was ground here and transported by horse and cart as far as Kettering and Rothwell. Corn continued to be ground here right up until August 1960. 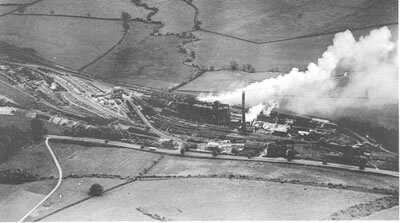 Apart from agriculture there were two main industries in Islip – the manufacture of horse collars and rush mats and the quarrying of iron ore.
Iron Furnaces, Kettering Road. Building of the Islip Furnaces was commenced in 1871 by Charles Plevins, and the first ingot or `pig’ was cast on April 20th 1873. At this time there were only two furnaces, but business prospered, and in 1879 two further furnaces followed. Generally only three were in use at one time, with the fourth being relined. The easily obtainable ore around Islip and Slipton had been removed by the turn of the century. In 1902 a German mining engineer, Hans Wolfe, was brought in to undertake the mining of the ore, which proved too deep for economic opencast working with the methods then available. Wolfe’s methods proved to be safe and successful. However, during the last war he retired, and in order to gain more ore, a system of `mine robbing’ was undertaken, and further cuts were made half way between the original cuts. As a result, the support for overburden was then much weaker and several subsidences have occurred in the area of Drayton Park. During the war it was essential to keep the site hidden from the eyes of the German bomber pilots, and the escaping burning gas was a problem, as it lit up the night sky. This surplus gas was allowed to lift an escape valve at the top of a small chimney on the working platform, and burn off. It was decided the best way to hide this was to erect corrugated roofing over the working platform and `pig’ bays. The result of this was many of the men suffered the effects of gassing and extreme heat. Work continued at Islip for nearly seventy years, the first `pig’ being cast on April 20th, 1873 and production finally halted on 16th Oct.. 1942 when the last `pig’ was cast. 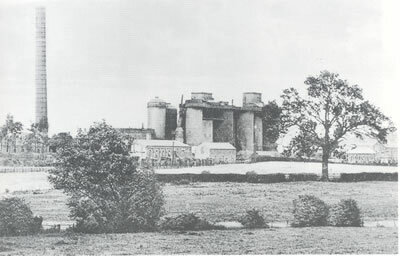 The furnaces and associated buildings and workshop still remain, but the 185 foot chimney was felled on June 21st 1950. For at least 300 years rushes had been harvested from the River Nene. These rushes for centuries had been used to make horse collars, mats, baskets, chair seats and floor coverings. The Loveday family have been associated with this industry since the early 18′ and many villagers became rush – workers as the business expanded. After the rushes were cut, they were spread onto the ground to dry, and then used to make plaits. Flat strips 8″ wide were used to make lunch baskets for local ironstone workers. These baskets required 41 rushes. 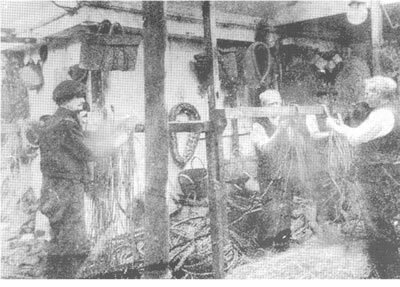 For horse collars, up to 50 rushes were used in three bundles to make a thick plait, which was subsequently made into a horse collar. The earliest record of the Lovedays in the parish register is the birth in 1699 of Thomas, son of Thomas and Ann. Thomas 2 was a matte – maker, and he probably learnt the craft from his father. Rush plaiting was a “cottage industry” and all members of the family of all ages did the plaiting. In 1914 a letter was sent from the Horse Superintendent’s office at Euston Station. stating that they had in use 5,540 collars made by Loveday and Sons of Islip and that the horse collars were thoroughly satisfactory. The factory finally closed in about 1960. Another family made horse collars in Islip, but on a smaller scale, in Todds yard. This family were the `Knights’ and in 1871 William Knight was employing three men to make rush horse collars. William and his son Frederick came from Titchmarsh, and in 1905 Frederick built a new factory, which is now The Working Men’s Club. Business boomed, and other products made at the factory were matting, dinner baskets, stool and chair seats. After World War I the rush industry slumped. Horse drawn vehicles were being replaced by the combustion engine and the business came to a close in 1918. The factory was sold to the brewery.